Eden Hazard has started the biggest rumour of the upcoming January window by stating that he has a soft spot for Real Madrid. The Belgian has 18 months left in his contract as of now and Chelsea have been trying to tie him down to a new deal. Real Madrid were supposedly interested in him in the summer, as a replacement for the outgoing Cristiano Ronaldo. However, they signed his club colleague Courtois instead and a deal to take him to the Santiago Bernabeu never materialized. Hazard added fuel to the speculations last month, after scoring his 7th goal in the Premier League against Southampton. He admitted to the reporters after the game that he was thinking of his future and was torn between signing a new deal at Chelsea and moving to the "Best Club in the World" Real Madrid. However, he now seems to have taken a step further towards listening to his heart. The new (Chelsea) coach (Maurizio Sarri) thinks football like me, so we'll see. The family is in London, I'm also going to be 28. I do not want to have any regrets at the end of my career. It's a decision I'm going to make, I do not know when, but I'll take it. You know me, I've always loved Real, even before (Zinedine) Zidane. We'll see what happens. As I said, I'm already finishing this year with Chelsea, I still have a year left of my contract after this year. As usual, his statements have caused a frenzy and there are lots of unspecified reports coming in about him joining the Spanish Giants, as well as Chelsea making him their highest paid footballer. Year 2030 ; Eden Hazard still dreams of playing for Real Madrid. Lets be honest, if Hazard stays & retires at Chelsea he will be up there with our top legends for what he’s done with this club. Would you rather that and leave a club on the up or join a declining Real Madrid? I think he should stay. 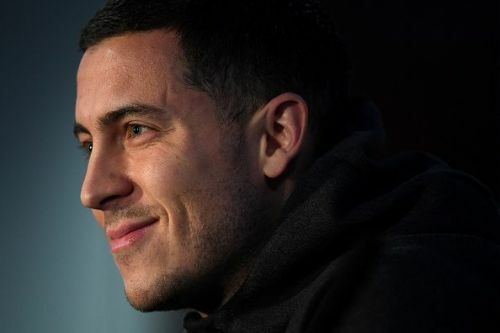 As sad as it’s sounds, it looks like Eden Hazard is waiting for Real Madrid to make their move for him. If that’s the case, we need to get as much money as possible, sign a top top player and play Callum Hudson-Odoi more. Cue the ‘jumping ahead of the queue’ websites announcing agreements over Eden Hazard & Real Madrid like last summer. Before that happens there has to be an official offer first. Last summer it rained agreements on the web while Chelsea kept the door shut and there were no talks. No player has, and no player will ever be bigger than the club. This will always be true no matter what.